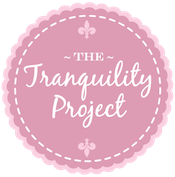 dearest readers o' tranquility. i have a few fun projects in the pipeline that i can't wait to announce. 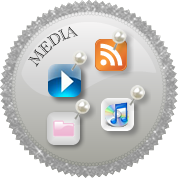 in the interim, here's one new goodie available tonight through september 30! 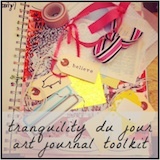 as you know, i'm a sucker for art journaling and am over the moon to announce this specialty tranquility du jour art journal toolkit. each kit will be filled with heaps of goodies listed below, lovingly put together by moi in a handmade velvet pouch tied with vintage ribbon, and shipped by october 9.
special bag of tea . 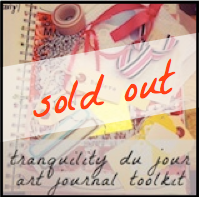 . .
why an art journal toolkit? ooh la la, i'm so glad you asked. since discovering the world of art journaling, i use it as a tool to bring dreams, challenges, and inspiration to life. it takes pen-on-paper journal writing (my first 30 years of journaling) to a whole new level. i love toting it in my handbag, adding inspiration found in daily life with colorful tape, and penning thoughts with a marker over the imagery. 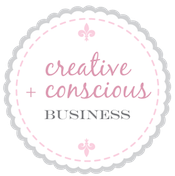 fashion designers, crafters, painters, and homemakers use them to honor their creativity. you can, too! make creative play an intention for fall. this toolkit will serve you well on the playground. all you need is your creative flair, a glue stick, and your favorite pen to get going! this is a fantastic idea, kimberly! 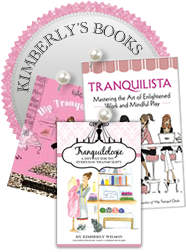 so excited you are doing it ... custom kimberly sparkle and tranquility will surely jumpstart my art journaling! of COURSE i already ordered min :) (happy to pick up at Arlington but maybe we want to keep USPS workers employed) merci buttercups! Love love love!! Thanks so much Kimberly, been wanting to get started with art journalling but haven't known how. THis is my answer!! This is fantastic! Will you be doing a planner/calendar for next year? I'd love to have one of those!